Tetracycline stained teeth are a challenge for dentists to properly treat. Anyone who has Tetracycline stained teeth knows how the dark discoloration can negatively effect self confidence. Because the staining occurs during adult tooth development, it is common to see the staining take the form of horizontal banding across the tooth surface. The antibiotic effects both the inner dentin and outer enamel layers during development making it a challenge to properly treat. One of the biggest challenges is that the deep dark staining is resistant to normal teeth whitening procedures. Two weeks of professional dental teeth whitening may make yellow teeth whiter, but Tetracycline stained teeth are stubborn and may take much longer to whiten. This can give patients the feeling that whitening does not work. Whitening can help, but in many cases, the teeth will not finish with a nice white color, but a gray white color. This could be a big improvement to the darker shades of Tetracycline staines, but persistence with the correct products is important. Kor whitening product has the best results on Tetracycline stained teeth. Step one for Tetracycline stained teeth is to whiten the teeth properly. This will begin with a one hour in-office whitening application of Kor whitening gel, followed by two weeks of at home Kor whitening, followed again by another application of one hour in-office Kor whitening gel. Patients with Tetracycline teeth will notice some improvement, but results do vary depending on the severity of the staining. Some patients will benefit for home whitening treatments of up to a month or longer. It is important that the office creates custom trays that fit precisely for the treatment from detailed impressions of the teeth. Trays that fit incorrectly will allow saliva to infiltrate with the whitening gel breaking down the free radicals that create the whitening reactions with stain causing molecules. Saliva is the enemy of whitening gels. Trays that are cut incorrectly allow for the highly reactive whitening gel to irritate the gums around the teeth. The other common treatment for Tetracycline stained teeth is porcelain veneers or crowns. Because these treatments can cover the teeth, they have the ability to completely block out the discoloration and make the tooth color a beautiful shade of white. Porcelain veneers can be very challenging for dentists as a treatment modality for very dark teeth. 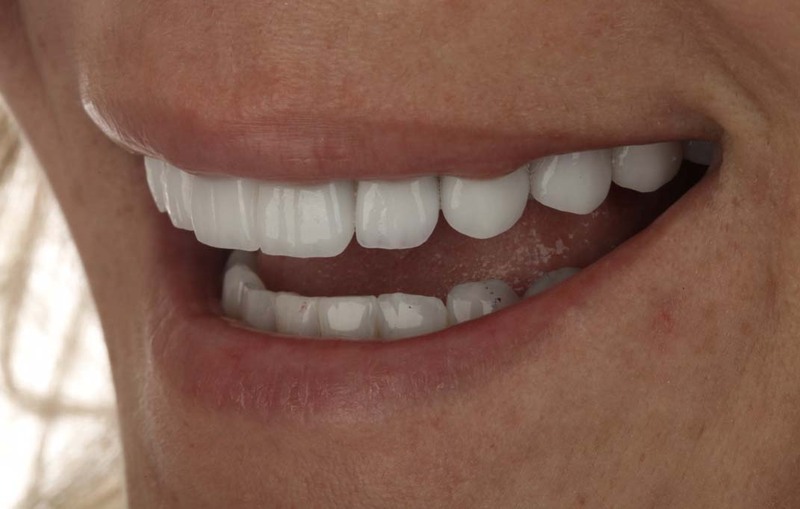 Porcelain allows for light transmission through the material, this optical property is in part what makes veneers look natural, but in working with darker teeth it can be a detriment to the final results. The dark bands and gray stains from natural teeth get “Pulled through” the porcelain and the final color is not a pretty white, but has a gray cast to the final veneer. A thicker veneer does better with blocking out the darker shaded teeth, but there is a catch. The more enamel you remove from a Tetracycline stained tooth, the darker it gets! Dentists frequently over reduce these teeth, making the blocking out of the dark stains even more difficult. Intense whitening treatments followed by minimal preparation feldspathic or lithium disilicate veneers are more indicated. Feldspathic veneers used to treat the dark banding from the prepared teeth above. Another common technique is to use dental crowns instead of veneers. Crowns can have substructures that completely block the transmission of light. 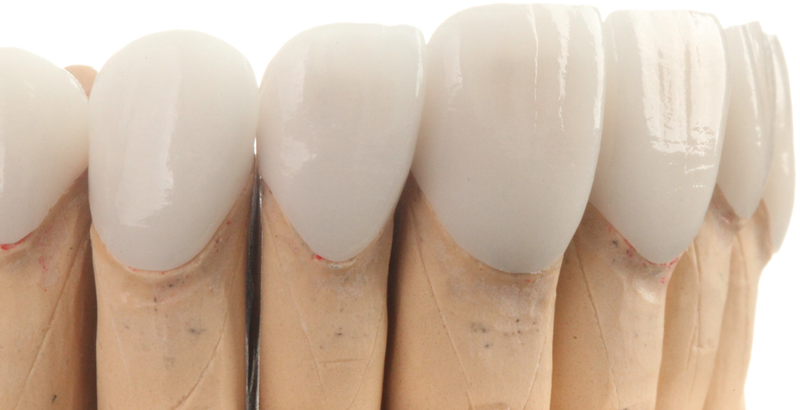 The dental technician will then add pretty porcelain on top of the substructure. The final result can also look very beautiful, but the technique is more aggressive. The first choice will be for whitening and veneers, but crowns could be indicated depending on the intensity of the staining. Whitening teeth followed by empress veneers removes the worst discoloration and finishes with the porcelain.